Sports Illustrated digital editor Mark McClusky talks SI.com's "biggest six months in history"
"We’re growing faster than any of the other top-10 sites, we’re up 61 per cent year over year since September if you look at the comScore numbers, and our last six months have been the biggest six months ever in the history of the site." It’s a tough time for many web publishers, with concerns over everything from Facebook algorithm changes to pivots to video and more. 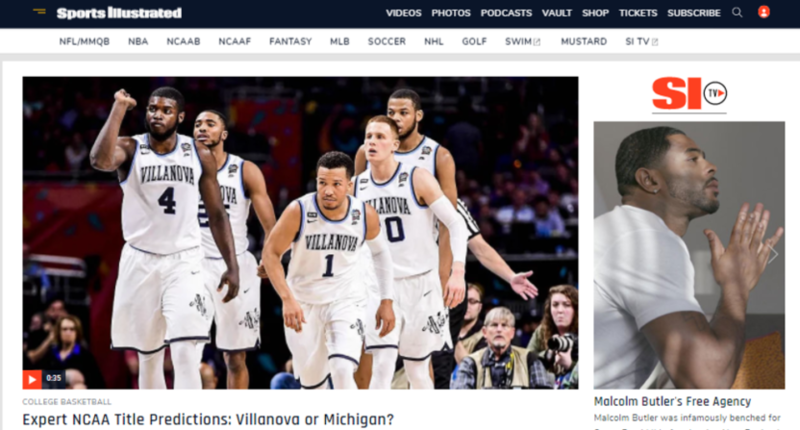 That makes it perhaps particularly interesting to hear that Sports Illustrated — an outlet with a long web presence, but one that many often think of more in terms of their print product — has posted the best web numbers in their history recently and grown very favorably against the competition. As per comScore data, SI.com posted its most unique views ever over a six-month span for the period from September through February and posted 61 per cent year-over-year growth in unique visitors, which almost doubled the rate of the next fastest growing in the category among the top 10 sites. SI digital editor Mark McClusky (who joined from Wired in August 2016) spoke to Awful Announcing in March about the success they’re seeing and what’s working for them. McClusky has been at the SI digital helm for around a year and a half now. He said his history with the brand helped him settle in, and his overarching focus has been trying to balance SI’s history of storytelling and journalism with material that connects with new audiences. McClusky said it’s important for SI to be known for cultural and fun things, but also to maintain their history of breaking news and telling deep, serious stories. As per SI Eats in particular, McClusky said even though food isn’t something SI has always covered, that vertical seemed like a logical fit for the site. Another change came on the NFL side, where ahead of last NFL season, they combined the MMQB team with their regular football team to get everyone on the same page. McClusky said that brought them plenty of traffic success. On the NBA front, McClusky said the recent vertical The Crossover (launched in October 2016, soon after his arrival) has been a big hit. Why launch a vertical rather than just a NBA subsection, and what’s the difference between the two? McClusky said verticals are more about an overarching coverage tone and mission. A pre-McClusky vertical was the Tech and Media hub. He said that area hasn’t received a ton of recent focus, but there are plans to do more on the technology front going forward. SI has also launched some Spanish-language coverage, and McClusky said that’s been a big success. Overall, McClusky said the key for them is not to get too focused on any one platform or traffic source, but to use all of those to build a successful overall picture.